Walid Phares is a right-wing conspiracy theorist and university professor who has served as an adviser to Donald Trump. Phares appears regularly on Fox News and writes columns for a variety of publications on issues related to terrorism, the Middle East, and U.S. foreign policy. Phares has also been associated with neoconservative advocacy groups, having served as a fellow at the Foundation for Defense of Democracies. Phares argued that “academic intellectuals” are ultimately responsible for this approach toward terrorism by pushing the U.S. government to focus on domestic matters. “Now you have hundreds and hundreds of advisers of academic intellectuals who are framing the debate, with the executive branches mostly—and most of them with Congress, with [the] media. So, now, the elite is blocking the government, various governments, from understanding what the threat is, diverting them into other issues, such as, ‘Oh, they don’t have jobs,'” Phares proclaimed. In October 2011, Republican presidential candidate Mitt Romney included Phares on a list of foreign policy advisers that included a host of neoconservatives and other like-minded foreign policy hardliners, including Eliot Cohen, Robert Kagan, Michael Chertoff, Eric Edelman, John Lehman, Dan Senor, Vin Weber, and Paula Dobriansky. Commenting on the list, one journalist wrote that most of the advisers “are known for their neo-conservative and strongly pro-Israel views. Remarkably, three of the top advisers … serve on the four-man board of directors of the Foreign Policy Initiative (FPI), the ideological successor to the Project for the New American Century (PNAC). Regarding Phares, Lobe wrote that he is “controversial for his past ties to the militant Phalange movement in Lebanon,” a right-wing Christian militia that was notorious for its violent repression of Palestinians, committing several massacres during the Lebanese civil war (1975-1990). In 2006, Phares “launched a third career as policy entrepreneur,” becoming a fellow at the Foundation for Defense of Democracies, a think tank that serves as home base for a number of neoconservative ideologues, and took up teaching a course at the National Defense University. He became a favorite of the neoconservative set advising President George W. Bush, began testifying before Congress, and became a regular on Fox News. Phares frequently appears at conferences alongside other neoconservative figures. In 2006, for example, Phares was featured at a conference on “Understanding the Iranian Threat” hosted by the American Foreign Policy Council (AFPC). Other speakers included former CIA Director James Woolsey and Patrick Clawson of the Washington Institute for Near East Policy. In June 2015, Phares praised a letter signed by numerous hawkish former officials and experts in support of the People’s Mujahedin of Iran (MEK), a militant Iranian organization that advocates for the overthrow of the Islamic Republic of Iran and was until 2012 on the State Department’s list of terrorist organizations. “American luminaries are advocating for the U.S. government to open up direct, collaborative talks with the Iranian resistance,” Phares said of the letter, which was signed by neoconservative figures like former U.S. ambassador to the United Nations John Bolton, former Connecticut Senator Joe Lieberman, retired four star general Charles Wald, lawyer Alan Dershowitz, and former George W. Bush officials Paula Dobriansky and Mitchell Reiss. Other conference participants included Peter Ackerman of Freedom House; former Spanish Prime Minister José Aznar; Anne Bayefsky of the Hudson Institute; Jeffrey Gedmin of Radio Free Europe; Reuel Marc Gerecht, Joshua Muravchik, Michael Rubin, Michael Novak, and Richard Perle of the American Enterprise Institute (AEI); Farid Ghadry of the U.S.-based Reform Party of Syria; former Czech President Vaclav Havel; Bruce Jackson of the Project on Transitional Democracies; Josef Joffe of Germany’s Die Zeit; Garry Kasparov, the famous chess player and member of the Russian opposition party United Civil Front; Sen. Joseph Lieberman (I-CT); Tod Lindberg of the Hoover Institution; Herb London of the Hudson Institute; Clifford May of the Foundation for Defense of Democracies; Harold Rhode, a former Pentagon employee; and Natan Sharansky, the former Soviet dissident and chairman of the Adelson Institute for Strategic Studies. The Right Scoop, “Walid Phares: Everybody knows Obama supports the Muslim Brotherhood,” December 7, 2012, http://www.therightscoop.com/walid-phares-everybody-knows-obama-supports-the-muslim-brotherhood/. Bill Hoffmann and Kathleen Walter, “Phares: Obama Administration Has Given Morsi ‘Green Light,’” Newmax.com, November 29, 2012, http://www.newsmax.com/Newsfront/phares-morsi-green-light/2012/11/29/id/465896. 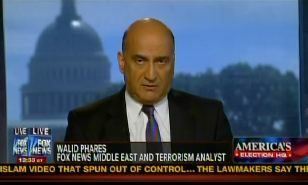 Wanda Carruthers, “Walid Phares on Terrorism: Obama Has Policy of ‘Appeasement,’” Newsmax, January 9, 2015, http://www.newsmax.com/Newsmax-Tv/terrorism-jihad-policy-advisers/2015/01/09/id/617598/. Philip Rucker, “Mitt Romney taps foreign policy, national security advisers,” Washington Post, October 6, 2011, http://www.washingtonpost.com/politics/mitt-romney-taps-foreign-policy-national-security-advisers/2011/10/06/gIQAnDHzPL_story.html. Jim Lobe, “Republican Frontrunner Touts Neo-Conservative Foreign Policy,” Inter Press Service, October 7, 2011, http://www.ipsnews.net/2011/10/us-republican-frontrunner-touts-neo-conservative-foreign-policy/. Quoted in Eli Clifton, “Romney Adviser: Al Qaeda Is Stronger After Bin Laden’s Death,” ThinkProgress, May 3, 2012,http://thinkprogress.org/security/2012/05/03/476812/romney-adviser-al-qaeda-is-stronger-after-bin-ladens-death/. Eli Clifton, “Romney Adviser: Al Qaeda Is Stronger After Bin Laden’s Death,” ThinkProgress, May 3, 2012, http://thinkprogress.org/security/2012/05/03/476812/romney-adviser-al-qaeda-is-stronger-after-bin-ladens-death/. As’ad Abukhalil, “Romney’s scary Middle East advisor,” Salon.com, October 7, 2011,http://politics.salon.com/2011/10/07/romneys_scary_middle_east_advisor/. Walid Phares, “Al-Awlaki Killing Will Not Stop the Jihad,” Newsmax.com, October 4, 2011, http://www.newsmax.com/WalidPhares/al-Awlaki-Killing-Jihad/2011/10/04/id/413256. 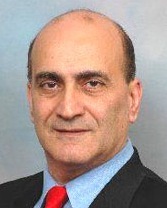 Walid Phares, “Preventing the West from Understanding Jihad,” American Thinker, July 17, 2007, http://www.americanthinker.com/2007/07/preventing_the_west_from_under.html. Walid Phares, “For Real Change, Work With The Iranian Resistance–Not The Iranian Regime,” Forbes, June 29, 2015, http://www.forbes.com/sites/realspin/2015/06/29/for-real-change-work-with-the-iranian-resistance-not-the-iranian-regime/. White House, Office of the Press Secretary, “President Bush Visits Prague, Czech Republic, Discusses Freedom,” June 5, 2007, http://www.whitehouse.gov/news/releases/2007/06/20070605-8.html. Democracy and Security Conference, “List of Particpants” (PDF), www.democracyandsecurity.org/doc/List_of_Participants.pdf.